I don't dislike vegetables, but it's just so hard to get those five daily servings. I've had a few friends rave about the Sneaky Chef Cookbook, and while I intend to purchase it the next time I make an Amazon order, I have to be my own "sneaky chef" for the time being. On the list of my favorite foods is lasagna. 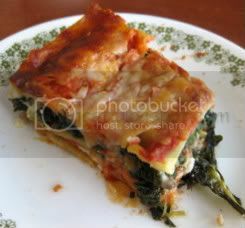 Unfortunately, lasagna is one of those dishes that is not exactly healthy, what with the cheese, and meat, and cheese, and pasta, and did I mention cheese? Cheese is delicious. In order to make this dish a little more diet-friendly, I made a couple substitutions and additions to the traditional meat-and-cheese lasagna I grew up loving. While the noodles are boiling, brown the ground sirloin in a large skillet over medium-high heat. The noodles should be boiled long enough that they are nearly cooked. They will finish cooking in the oven. In another large skillet, sauté the kale (make sure it's washed and cut as if you were making a salad) over medium heat, with a small amount of EVOO, and season with a bit of oregano and garlic/sea salt blend (not too much, just a couple of pinches of each for flavor). Stir the kale and sirloin frequently to prevent sticking. When the sirloin is nearly finished cooking, transfer the kale into the skillet with the sirloin, to finish cooking. When the sirloin is thoroughly cooked, turn heat down to warm. You'll know the kale is done when it is a deep, dark green. In the same skillet used for the kale, sauté the baby spinach in the same manner as the kale. Transfer to the skillet with the sirloin and kale, and stir it all together. Next, prepare a 9x12 baking dish with non-stick spray, and pre-heat the oven to 425°F. Ladle a thin layer of sauce in the bottom of the dish, and place three noodles over the top. Then spoon out 1/2 of the sirloin/kale/spinach mixture over the noodles and spread it evenly in the pan. Next, spoon six dollops of ricotta over the sirloin mixture, pressing down on each dollop to spread it out a bit (you should use about 1/2 of the ricotta). Sprinkle 1/3 of the mozzerella and 2 oz. of the three-cheese blend over the top. Then, ladle out 1/3 of the remaining sauce over the cheese, and repeat layering. Over the final layer of noodles, ladle the remaining 1/3 of the sauce, and sprinkle the remaining cheese over the sauce. Place in the oven and bake until the top layer of cheese is deep golden brown and bubbling. Let it cool for 10 minutes, cut and serve! The thing I really love about lasagna is it's so easy to make and there are tons of leftovers, so in a small household, you've got your lunches and dinners for pretty much the whole week! And if you don't like eating the same thing all week, you can freeze it for later. Okay I really like this recipe and I want to make lasagna tonight so I am going to try it! Wish me Luck!